Count me in! I'm playing along with Shari et. al. at The Glass Doorknob. This isn't a new photo -- it was taken in Shelbourne, Vermont, the beginning of December out the window of our bed and breakfast. While it's pretty cold here right now, there isn't so much white laying around. I have a few lumps still on my driveway....snow that is. I love the photo taken through the screen. Yes, those vermont mornings are full of icey stuff. Hope all is well in babyland. I love all these pictures of ice - they are all so different! 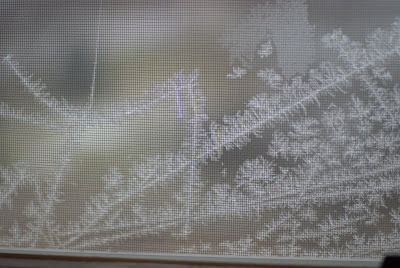 I posted an icy plant and I've seen another of icy water and now an icy window! I went to Shelbourne a couple of years ago and loved the museum - all those old buildings, buggies, quilts etc. wow, i've never seen ice on a screen like that before. that's a great shot. Even if you had to sit on her, it's a great picture of Scout. Seems to me I've never met her in real life. Someone needs to road trip? Sorry, we have white abounding around here. And it's NOT making me smile. Thanks for sharing yours then.